Home 2010 Election Brokeback candidates Brokeback Mountain Humor humor posts Presedentiables Presidential Candidates vote voters Brokeback Presidentiables! What do you think will happen if our presidential candidates love each other instead of fighting one another the way they did now? 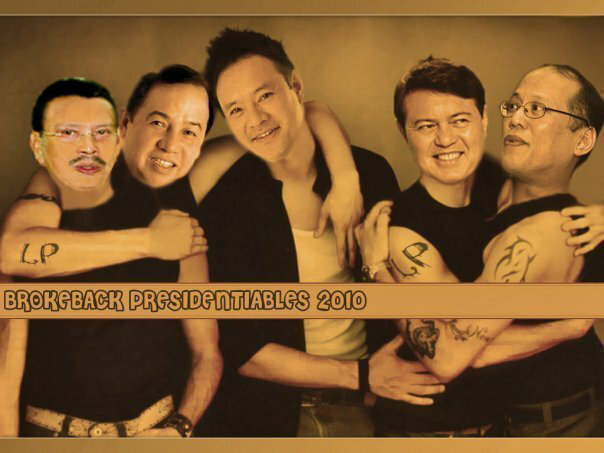 Well, the result will be...'Brokeback Presidentiables'! Haha! This is another image tagged to me by my friend in Facebook. It is now widely circulating around the net! Hmmm...the picture really smells fishy huh! But then, it makes the coming 2010 Presidential Election this May 10 lighter and funny! Virtually, there's no war, hatred, and fight between each candidates! Hope that they were like that...too close...treating each other more than a bestfriend! Haha!